karakter ook op lagere hoogte. vasteland en die van Groot-Brittannië (en Ierland). • De uplands zijn de licht- en donkerbruine gebieden samen. (van noord naar zuid) (het getal tussen haakjes is hun hoogste top). .. 3. Brecon Beacons N.P. (886 m). 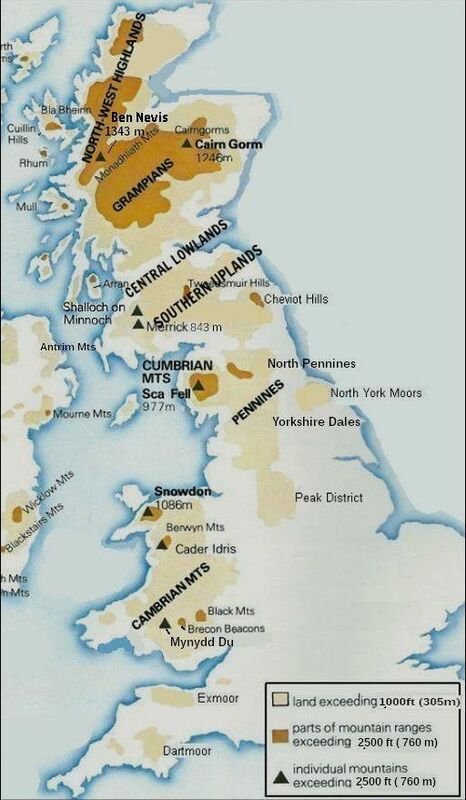 ...Upland areas in Wales .)(. Alleen de lagere delen langs de kust en in Pembrokeshire zijn lowland. ( Zie bijv. het hoogteprofiel bij mijn pagina van Glyndwr's Way. • Nationale parken in Wales. at 1,085 m being the highest peak. collectively as the Welsh 3,000s. most of the central part of the country. 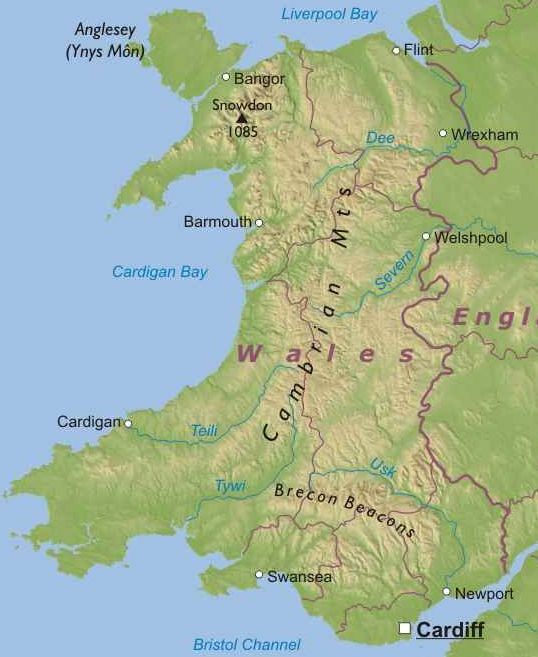 The Cambrian Mountains, which form the core of Wales, are clearly defined by the sea except on the eastern side, where a sharp break of slope often marks the transition to the English lowlands. Cycles of erosion have repeatedly worn down the ancient and austere surfaces. Many topographic features derive from glacial processes, and some of the most striking scenery stems largely from former volcanism. 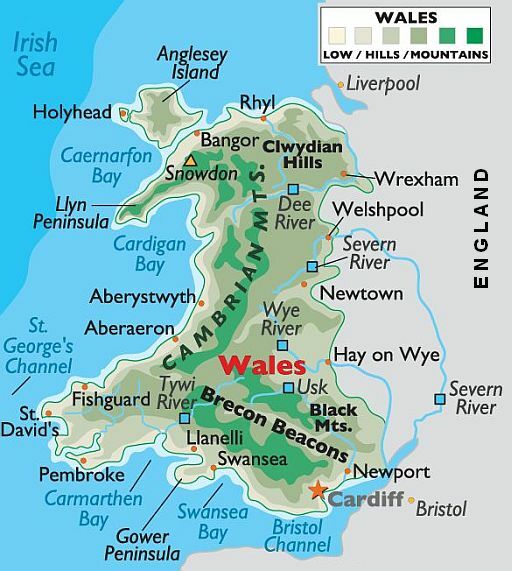 The mountain areas above 2,000 feet (610 metres) are most extensive in North Wales. These include Snowdonia—named for Snowdon, the highest point in Wales, with an elevation of 1,085 metres—and its southeastern extensions, Cader Idris and Berwyn. the monadnocks of South Wales—notably the Black Mountains and the Brecon Beacons—stand out in solitary splendour above the upland surfaces. There are three such surfaces: a high plateau of 1,700 to 1,800 feet (520 to 550 metres); a middle peneplain, or worn-down surface, of 1,200 to 1,600 feet (370 to 490 metres); and a low peneplain of 700 to 1,100 feet (210 to 340 metres). These smooth, rounded, grass-covered moorlands present a remarkably even skyline. Below 700 feet (210 metres) lies a further series of former wave-cut surfaces. Several valleys radiate from the highland core to the coastal regions. In the west these lowlands have provided a haven for traditional Welsh culture, but the deeply penetrating eastern valleys have channeled English culture into the highland. 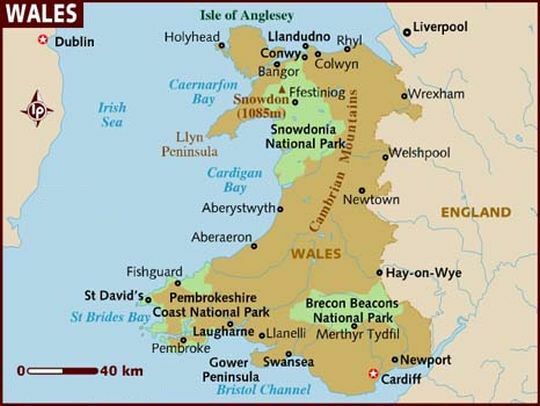 A more extensive lowland—physically and structurally an extension of the English lowlands—borders the Bristol Channel in the southeast. The irregularities of the 600-mile (970-km) Welsh coast show differing adjustments to the pounding attack of the sea. The Brecon Beacons and the Black Mountain in south Wales are also made of Old Red Sandstone, but these hills were glaciated and the scenery is more spectacular, with the hillsides carved out into great precipices and corries.